Punch-Gate Begets Feces-Gates, And Then We All Just Laugh And Laugh And Laugh. Regardless of the what, something happened to Timmy’s eye, so the local media was rightly intrigued, and the next thing you knew, Lindy Ruff and Roy-Z were being asked about it after practice. Connolly is conveniently nursing a groin injury from the comfort of his home, far away from the prying eyes of the Buffalo News. THEN, John Vogl got compleeeeeetely asinine and wrote this little gem about how it’s ALL TWITTER’S FAULT! FECES! GET OFF MY LAWN! I actually think this post is so poorly argued and utterly ill-informed that I’m not even compelled to respond except to say that if Vogl wants to get his newsie-britches all twisted up into a bunch over misinformation on Twitter, he should take it up with former Sabre and current ESPN employee, Matt Barnaby. 1.﻿﻿ The story that Lindy Ruff is apparently going with (and sticking to!) is that Tim Connolly fell and hit his head while rehearsing a routine that was to be performed during the catwalk. I find this 100% believable (except by “practicing a routine” I think Lindy meant Timmy was, “flailing about like a drunk baboon”), and at LEAST 70% sympathetic. Who among us hasn’t sustained a minor injury here or there after a few beverages? It happens, you know? Unfortunately for Timmy, he’s a handsomely paid professional athlete, so theoretically he and Roy-Z probably should have understood that reenacting the tricky “I’ve Had the Time of My Life” lift from the end of “Dirty Dancing” while drunk backstage at the Catwalk for Charity is inherently risky. But can you blame them for wanting to put on a good show? NO! You can’t! Yeah, you read that right. The Buffalo News is sending me a piece of MAIL, that will be delivered to my MAILBOX (not the inbox in my computer, but the actually physical mailbox I have attached to my house), delivered via the US Postal service using an actual STAMP, so that I can begin “commenting right away”. This is BEYOND redonk. Now look, I applaud TBN’s for their efforts to eliminate the racist comments left on their articles. I think it’s healthy to insist that people attach their actual name to what they write on the interwebs, but seriously, this system is absurd. There has GOT to be a better, faster way to verify that people actually are who they say they are than sending them a piece of mail MADE OUT OF PAPER. No wonder John Vogl is so confused and angry about Twitter. If the TBN commenting policy is any indication of how things go over there, Vogl is working in an office that utilizes the technology we’re used to seeing on “MadMen”. 3. There ARE good, social media-savvy people working at the Buffalo News. @BNHarrington is one of them. There are many others, but truthfully, I took a Tylenol PM before I started writing this post, and as a result I’m too tired to be linking all over tarnation right now. Now look. I’ve been to a few bad games in my day. I’ve seen them lose big, I’ve seen them lose pathetically, and I’ve seen them skate onto the ice, point directly at my chair and say, “Hold on to your hat, because we’re going to break your heart tonight, Katebits”. But I’m not sure I’ve ever seen a game that was quite that bad in terms of entertainment value. That game was a. boring, b. stupid, c. lame. Good thing for big beers. But the good news is, all of the miners are out of the earth (can you BELIEVE they got all of those guys out?! That is miraculous. ), AND I got to sit in a suite for the third period. So, all in all, things could be worse. I spent a lot of time trying to write a post today. I tried a funny one, I tried a serious one, I even tried an angry one. But all of those posts felt forced and unfocused. 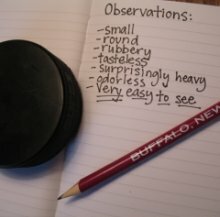 After trying to blog for awhile I realized that, basically, I feel really off-kilter about the Sabres. Uneasy. I don’t have a clear sense of what actually happened with Kennedy, nor am I able to use solid, grown-up logic to explain the deep sense of disappointment I feel towards Sabres management. All I know is that after Darcy’s press conference I felt really, genuinely icky about the Sabres. Maybe this is just one of those times when the business of sports is difficult to swallow as a fan, or maybe something much more gross and/or pathetic is going on with the Sabres, but honestly, I’m not sure I care. The bottom line is this: I love the Sabres, but I don’t want to be losing faith in them in August. If I’m going to lose faith, I want it to be during the season, in person, while I’m paying perfectly good money to sit in my seats at the arena. So, please do me a favor, Darcy. I’m begging you. No more press conferences until October. I’m TRYING to suspend my disbelief over here, and you’re making it really difficult. You may or may not have noticed this, but I haven’t written on this blog in, oh, ten million years, give or take a few millennium. 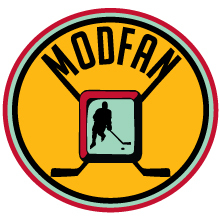 I can’t remember a time in the three years I’ve been writing this blog when I’ve thought so little about hockey or blogging. I went on hiatus. 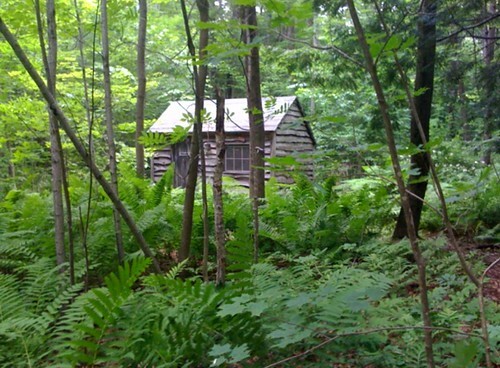 This year I lived down in the swamp (as opposed to up on the hill) in Cabin A. No bats, but I did live with at least one lunatic mouse who wasn’t even remotely afraid of me. I decided I didn’t want to pay ANY attention to hockey while I was at Apple Hill, and I think it was a good choice. Instead of paying any attention to the draft, I paid full attention to skit night. Instead of spending my day off catching up on hockey blogs, I spent my day off watching multiple World Cup games with fun and attractive people. 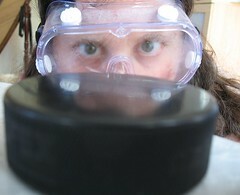 Instead of spending even one minute of my time and energy thinking about Darcy Regier, I was happy. I had a wonderful time at Apple Hill this year. I feel refreshed and invigorated and newly inspired to be as awesome as possible. Here’s what I came up with: Diddly poo. And honestly, do we really want to think too hard about the likes of Tim Connolly and Drew Stafford right now? No! We do not! It’s beautiful outside! We’re young, and we still have good hair and strong backs. We can spend our time doing almost anything. Gardening, practicing, flirting, painting rooms bright green, drinking and more drinking, cooking, sewing small squares of fabric together! The world is our oyster. This is no time to think about the Sabres. No time at all. Tomorrow, the Sabres will sign someone It probably won’t be too exciting, but it will be someone. If Darcy trades anyone from the “top six” I’ll eat my hat and I’ll also jump for joy. Let’s just wait and see what happens. If the Sabres want us to write about them more, maybe they should try being sassier. If they can’t be sassier I’m more than willing to make my own sass. We’ll meet back here tomorrow night and see if we’re feeling any more inspired to discuss the Sabres. If not, we’ll just think of something better to talk about. Life is short, you know?